Because Death and Taxes! 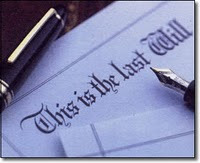 : Three Things to Know About Which Comes First: Financial Planning or Estate Planning? Hi Bernie, my name is Barry Haimo. I'm an estate and business planning attorney in Ft. Lauderdale, Florida. I enjoyed your post. I'm always looking for supportive content communicating the critical importance of estate planning to my clients. Thanks again.